This high-rise office building district of Karasuma Oike is the number one food district in Kyoto. In this bustling business district, there is a machiya-style tempura restaurant on Sanjo-dori Street called Tsukitokage Shinmachi. Lanterns are hung outside the front entrance. The door curtain has a lizard painting which is very eye-catching. After entering the shop, you can see a big wok in the bar area. The garden guest area is visible from the inner part of the first floor. There is also a wooden staircase leading up to the second floor guest area. The interior was renovated from an old building and gives people a feeling of nostalgia. From the outside, it looks like a very expensive Kyoto restaurant and may make people think twice about entering. However, the cheapest item on Tsukitokage's tempura menu starts at ¥30! This restaurant takes into account the customers' dining speed and present them with a timely succession of steaming hot tempura. The tempura dipping sauces on offer include radish puree, sea salt and seaweed salt, which give pleasure to your taste buds on multiple levels. In addition to the restaurant’s famous tempura, its all-year-round delicious oden is also highly recommended. Another selling point of the restaurant is its variety of Japanese sake sourced from many places in Japan. Nothing is better than a perfectly matched sake and tempura! The restaurant has an English-language menu. The service staff are also very enthusiastic, so you never have to worry about any problems with placing orders! 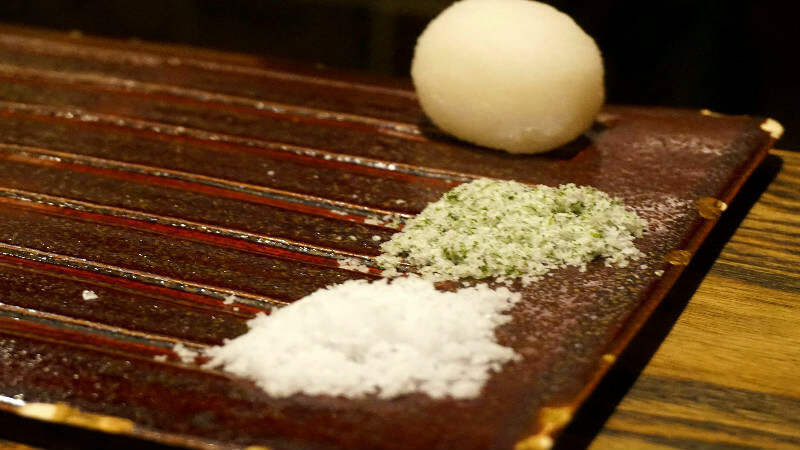 If you wish to experience a completely different bar restaurant, be sure to include Tsukitokage Shinmachi on your check list! Specially selected seasonal ingredients wrapped in thin coats of tempura batter and carefully cooked at the perfect temperature until they are crisp and fragrant and not overly greasy. In addition to the common ingredients, the restaurant also offers Kyoto-style tofu skin which is quite a rare menu item. The most special part is the three types of dipping sauces on offer: radish puree, sea salt and seaweed salt, so that diners can experience the different flavors of tempura. Salt brings out the sweetness of the ingredients and complements the vegetables perfectly! * There are many types of tempura. This is only a small selection. Oden ingredients incorporate the tasty juices of skipjack tuna stock and is delicious inside and outside. The konjac jelly you get here retains the flavor of skipjack tuna even in their center and are very delicious! The fragrance of the deep fried tofu, the tuna flavor of the renkon, the sweetness of the white radish, and the softness of the eggs give you a sense of the loving care with which the chefs have prepared their dishes. Japanese oden cuisine mostly uses yellow mustard sauce, and its slightly pungent aroma adds another layer of sensation to your taste buds. In addition to the above 5, other ingredients are also available. Before eating the fried tempura, we recommend that you order some entrees! Today's dishes from left to right are: ebiimo (a shrimp-shaped variety of potato), mushroom and Japanese mustard greens salad, and red konjac from Shiga Prefecture. The ebiimo prepared by the chef with great care and then stewed into a soft consistency, melts away as soon as it reaches your mouth. The mushroom salad comes with a slice of yuzu citrus fruit skin which adds an extra layer of aroma. The exceptional red konjac is one of the renowned dishes of Shiga Prefecture and has a spongy and tender texture. The entrees are different every day making you look forward to each visit even more. The dessert bringing this beautiful day to an end is also very special. The baumkuchen cake is dipped in flour and fried; after frying, it looks like tofu and has a crunchy exterior. The densely textured baumkuchen melts in your mouth. Eat it with a dollop of vanilla ice cream and the clash of warmth and coldness offers a unique sensation. A sprinkling of cinnamon powder on the side enriches the aroma even more. The baumkuchen is cut into bite-sized chunks and tastes so good you just can't stop eating! 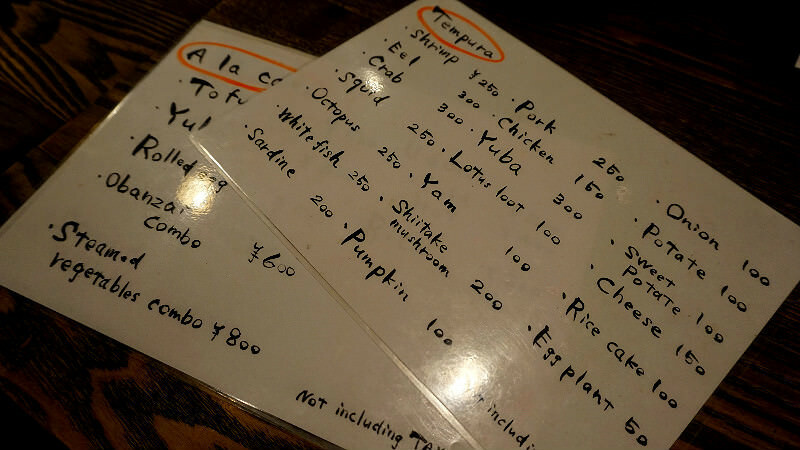 An English-language menu is available at the restaurant. Three kinds of dips are provided: we recommend that you taste the original ingredient first, and then dip it in sea salt or radish mud sauce for a different taste. Placing an order at a Japanese izakaya always begins with a beverage order. We recommend that you begin your food order with your entrees and then proceed to the tempura. Before Japanese people order their final desserts, they usually order a rice or a noodle dish to finish off their main meal. If you still feel a little hungry, you may wish to order another dish! I really like the machiya-style Tsukitokage Shinmachi! Sitting in the bar area and watching the restaurant owner fry tempura feels very exciting. The crispy batter and fresh ingredients combined with the tinge of sea salt is very fresh and not greasy at all. The shop also has a variety of sake, and the tempura is very tasty. And the final, baumkuchen with vanilla ice cream dessert, left me stunned! Such an inexpensive and beautiful restaurant. I urge everyone to go and try it. 5-minute walk from subway Karasuma Oike Station. The service staff are very enthusiastic. Even if there is a language barrier, they still do their best to try and communicate with their customers. The manager is also a very interesting person, so everyone can feel at ease about visiting this place and tasting their food!